Our attendance at the Samsung Global SSD Summit in South Korea brought us a first glimpse of a new standard in ultrabook storage performance. At the Summit, the Samsung XP941 M.2 PCIe SSD was displayed reaching 1GB/s transfer speeds and Apple has since released their 2013 MacBook Air which has a customized variation of the XP941; this attaining native performance of 794MB/s. Most recently, Sony released their newest Vaio Pro 13 which also appears to have the XP941 installed and there is no doubt this ‘trickle effect’ of distribution will become a waterfall soon enough. For the first time, even our request for a review sample was put on hold as Samsung can’t seem to keep up with demand. You can imagine our surprise when our good friend Rod Bland of RamCity in Sydney, Australia, asked if we would be interested in getting our hands on the new XP941 for review, sooner than later. Naturally, we jumped at the opportunity and the XP941 arrived from Australia in just under five days. Can anyone explain to me why it takes 3 months for my son to receive care packages from his mother while studying in Brisbane? In any case, the arrival of the Samsung XP941 left us in a bit of a predicament that had to be addressed; we had no means of benchmarking this rocket as our M.2 adapter equipped Asus mobo was only a single lane solution (500MB/s). Luckily, we had contacts in Taiwan who were able to create just what we had in mind…and fast. We needed a solution that was future proof and our friends at Soliton Technologies went all out and sent us a PCIe 3.0 x16 NGFF/M.2 adapter. Considering that PCIe 3.0 reaches a bit rate of 8 GT/s, which translates to roughly 985 MB/s per lane, ‘overkill’ is pretty fitting as a pet name for this adapter. Even the much touted LSI SandForce ‘Griffin’ based M.2 PCIe SSD, capable of 1.8GB/s will be childs play once we get it in our hands. 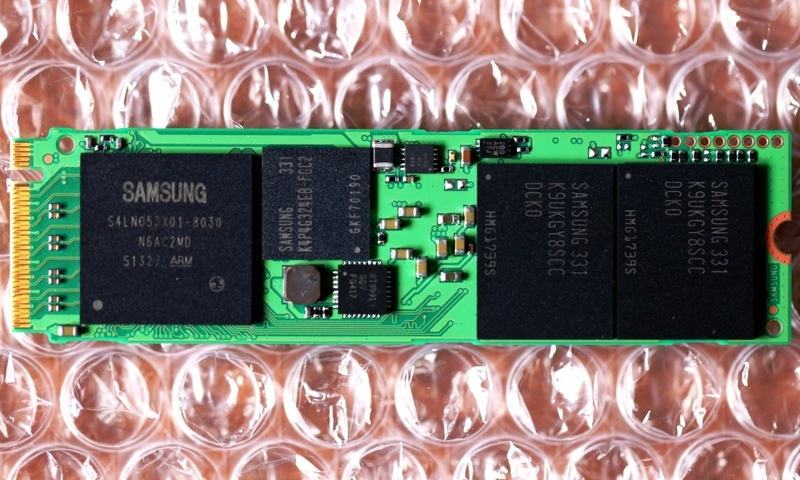 The Samsung XP941 is a client M.2 PCIe SSD and will be available in the notebooks of several manufacturers very soon. Although the XP941 will not be available as a retail SSD, it is available through limited third party vendors such as RamCity. Presently, we are aware that it is available in the newly released Sony Vaio Pro 13 ultrabook and, as well, a custom design of this SSD is found within the new Apple MacBook Air. 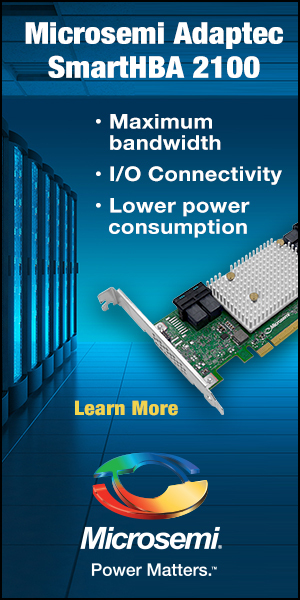 It is being manufactured in capacities of 128, 256 and 512GB and claimed performance is up to 1170MB/s read and 970MB/s write with IOPS reaching 122K read and 72K write, all within PCIe 2.0 x4 lane environment. Performance is variable, depending on capacity, and write performance of the 128GB capacity is 450MB/s with it jumping to 800MB/s for the 256GB capacity. 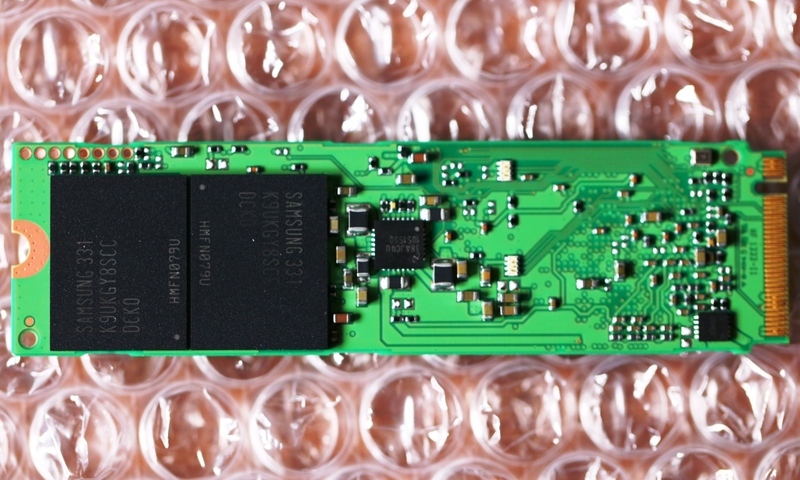 The Samsung XP 941 contains Samsung’s 3-core eight channel MDX (300MHz) controller which is custom designed for PCIe and eliminates the bottlenecks seen in SATA 3. 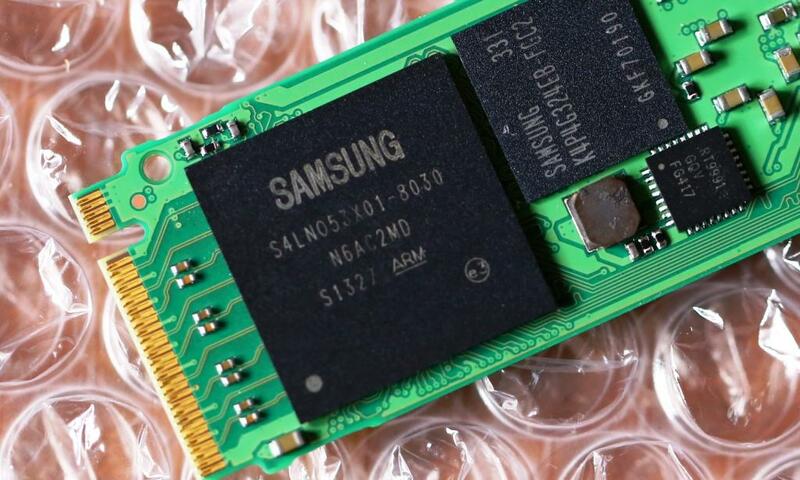 Beside the controller is 512MB LP (low power) DDR2 Samsung DRAM cache, along with 4 modules of Samsung’s 64Gb MLC NAND flash memory, each module having a RAW capacity of 128GB. Once formatted, the final capacity of the XP 941, that is available for user storage, is 477GB. As well, product warranty for client SSDs is the responsibility of each system manufacturer. Having said that, we have no problem giving a quick plug to RamCity as they have an absolutely massive selection of Samsung consumer, client and enterprise SSDs available for purchase. 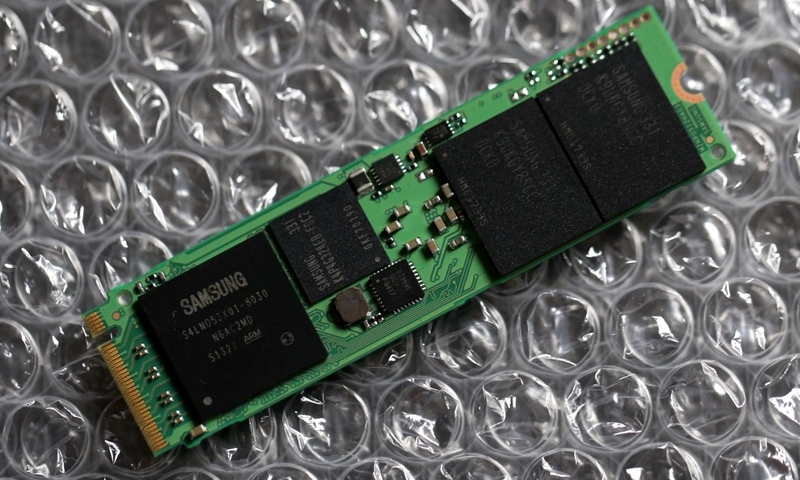 Where many find drives such as the Samsung 843T almost impossible to obtain in smaller volumes through Samsung, Ram City has them in stock and, well, they got our drive to us in Canada in less than a week. In my opinion Apple just prohibited a distribution of this devices for maybe half a year. It’s like the new Haswell chips from Intel. They pay a premium price and get the chips exclusively. Which pcie slot was the ngff adapter on? There’s additional latency if it’s connected to the x4 lane from the pch. X16 first slot on the Asus Maximus VI. No drivers were needed whatsoever. It was recognized and formatted without issue in the adapter. If you would like to suggest a possible driver, by all means we can try it out if it might improove the end IOPS. I recently purchased a Samsung Ativ book 9 plus. It has an msata toshiba ssd in it with a 2280 form factor. It is supposedly an m.2 form factor, but does that mean the controller actually resides on the drive ? Thanks. The controller IC is almost always soldered right to the PCB of the SSD regardless of form factor. Thanks ! Forgive my ignorance, but that mean the system would also support a pci-e m.2 drive in the 2280 form factor ? Yes I am wondering about your system as we arent aware of Samsung having released systems with the new PCIe as of yet. Can you do an ATTO or crystal DiskMark test and let us know the scores? In looking at this performance, you either have a mSATA or M.2 SATA SSD installed. In any event, you could not install a PCIe that would get better performance than this as your system is limited to the SATA speeds. What is your system model number. Thanks ! It’s NP940X3G-K01US. It’s a 2280 M.2 form factor according to some folks on a forum. It’s a “gumstick” ssd. Yup it may be, however, it is most likely still a SATA M.2. There is a difference between PCIe M.2 and SATA M.2 SSDs which, believe it or not as as small of a difference as the switching of wires in the interface. The end result, however, is that the SATA M.2 is still limited to SATA speeds as you are seeing here. 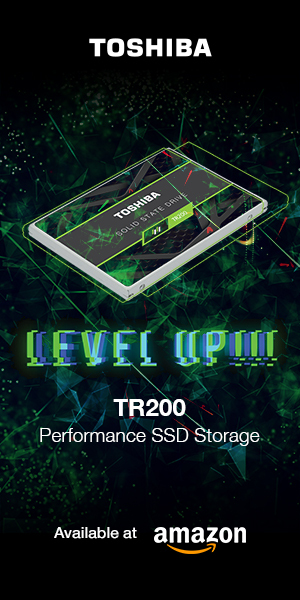 Your SSD is the Toshiba version and, in fact, we are about to review the 512GB capacity of that same SSD very shortly…have it right here in front of me. Thanks much, Les. At least now I can stop drooling over the pcie ssds ! I’ll still be upgrading this once I can find something bigger and with the appropriate form factor. Looking forward to your review of the 512 GB version. That article says ‘possibly both’ but that is not possible at this point. It is either one or the other, and quite frankly, I don’t see how it is possible. The system you have is a SATA M.2 and youre next quest will be to find a larger M.2 SSD no doubt. P.S. We tried the XP941 on the SATA system and it didn’t work. Thx for the clear and fast answer, then I’ll go looking for a bigger SATA M.2. Now I only have to wait until they are available 🙂 And I wasn’t talking about the Asus Maximus mentioned in this article, but the motherboard used in the Vaio Pro. I tried to figure out which motherboard is used by the Vaio and Everest only gives the following information: Sony SVP1321C5E. CPU-Z only mentions Sony as the manufacturer of the motherboard with VAIO as the model. Enuff already!!! They need to start selling the m.2s at newegg along with a simple 4x PCIE adapter. Nearly every mobo has an empty 4x slot in between the 1x and 8x/16x slots. Even better, since the m.2s are so small, LSI could make a killing by making a raid0 capable x4 adapter with room for a pair of m.2s. But noooOOO….everyone one’s gonna wait till next year for sata express to launch. Gah! !